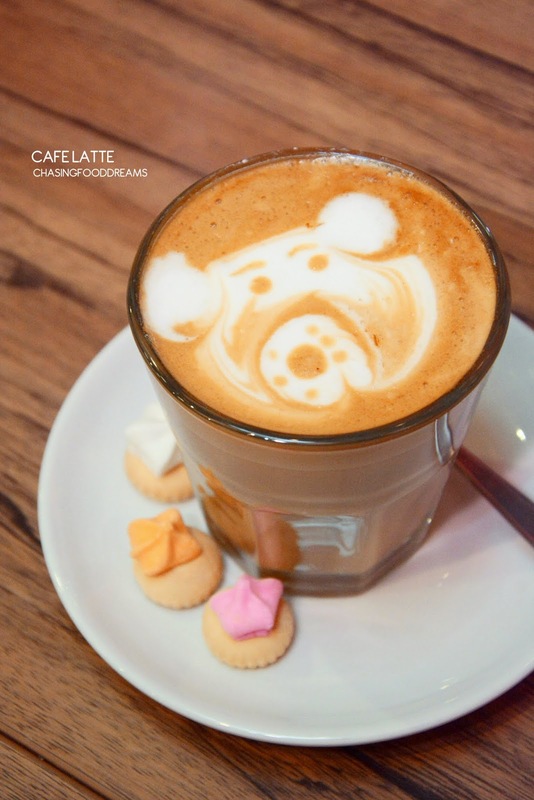 This article on Chili Espresso originally appeared in the Chillin’ @ Nexus Bangsar South online campaign. 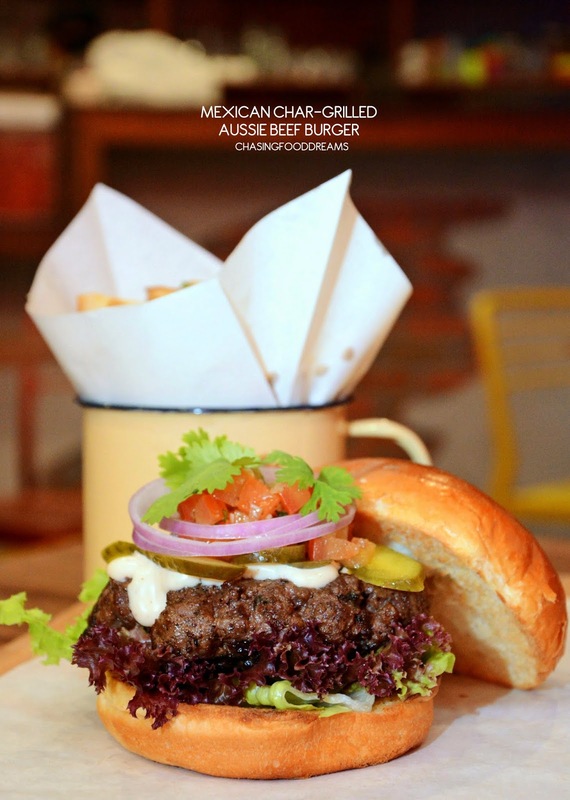 There’s always room for good food, and this round I had discovered it at Nexus Bangsar South with some foodies friends. 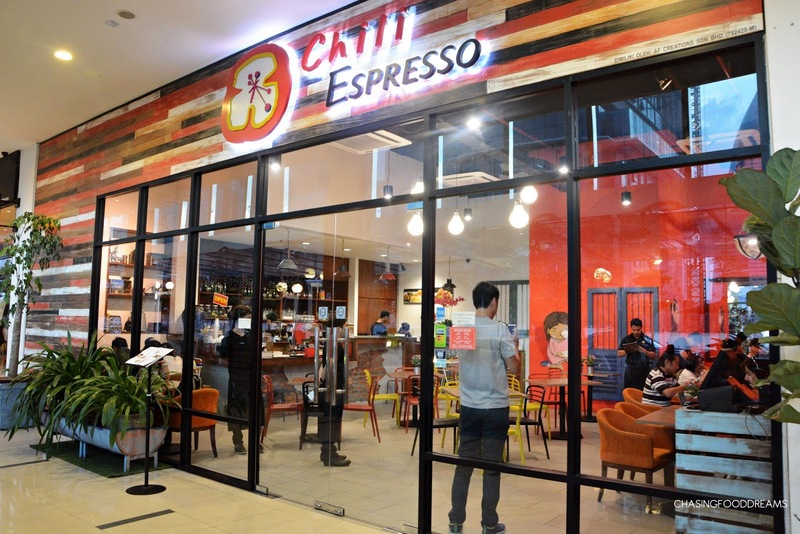 Chili ESPRESSO, opened in May 2014, is the second outlet to open after its first successful outlet that started 8 years ago in Sooka Sentral. The owner, Robert hails from the Pearl of the Orient and is set on following his passion for the food industry in serving up great comfort food at affordable prices. Chili ESPRESSO serves local and Western dishes with a spicy twist of its own. 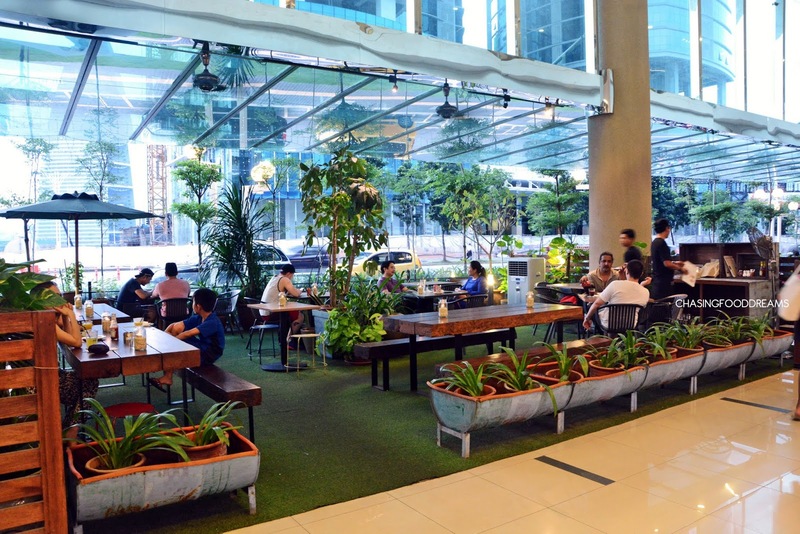 The restaurant at Nexus Bangsar South is beautifully bright, spacious and pretty at sight. 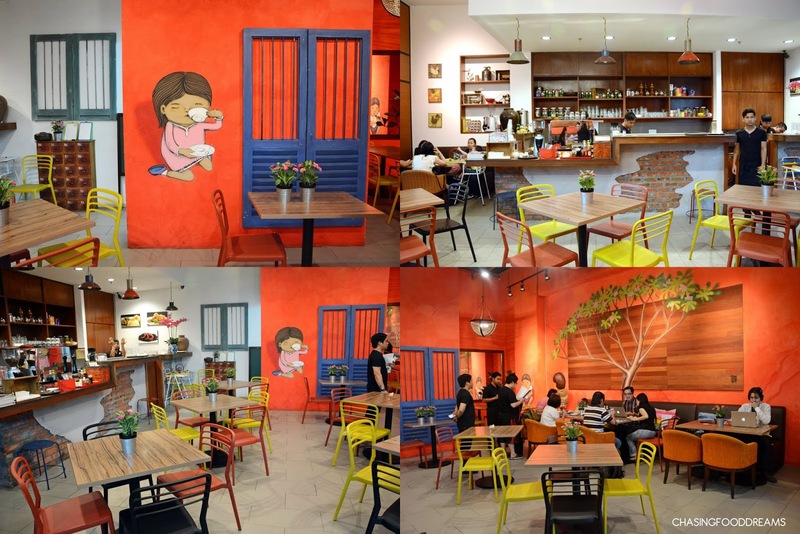 Taking its inspiration from Penang’s heritage city, the restaurant has art murals hand painted by Drew Funk, an Australian based artist on its walls. 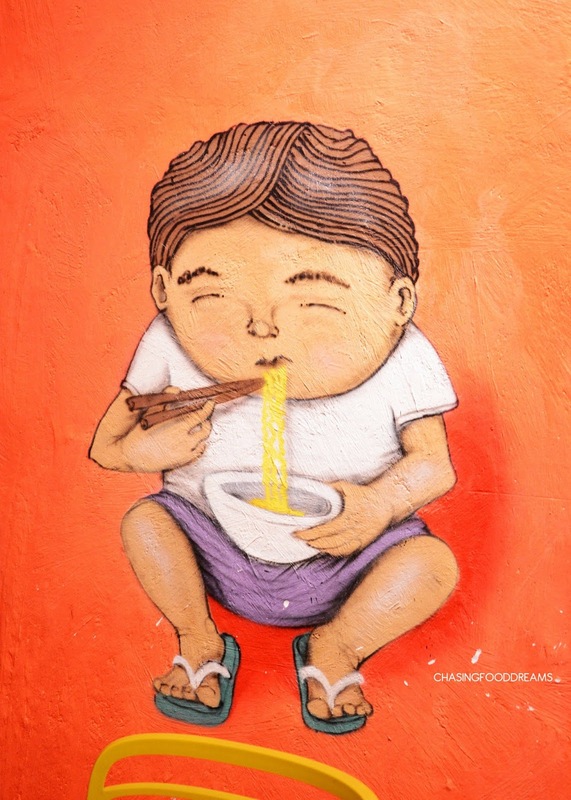 Inspired by the old pre-war shop houses in Penang, the bright bold red walls had cute art renditions of children and nature in a cheerful mode enjoying a cup of coffee or slurping noodles. A beautiful frangipani tree stood out at one wall. The art is further emphasized by the addition of 3D fixtures all over. Lots of colors are further injected through the furniture all over the space. A long bar with rustic materials added more charm to the place. Choose your seating inside in the cool ambience or al fresco in the garden inspired décor. 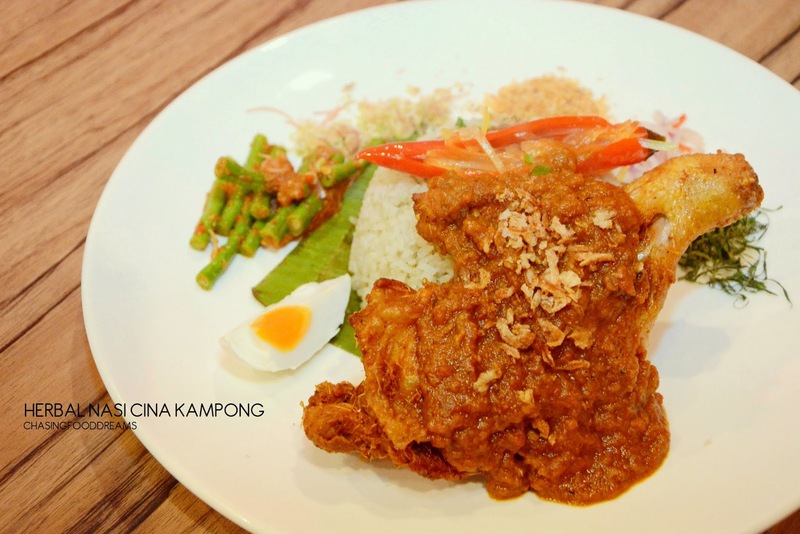 The menu is themed urban Malaysian cuisine with a mix of Asian and Western dishes. Diners can enjoy Malaysian street food as well as salads, pastas, pizzas, burgers, fish & chips, sandwiches and even breakfast favorites. The beverage menu is also filled with lots of coffee, tea, fruit juices and more. 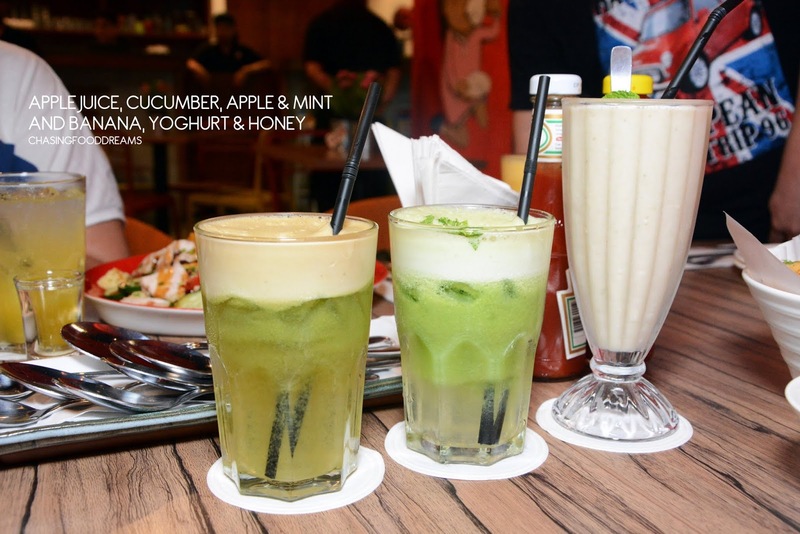 To start off the meal, we had Apple Juice (RM7.80), Cucumber, Apple & Mint (RM9.80) and Banana Yoghurt Honey (RM11.80). Beverages are sufficiently good and one can taste rich fruity notes. I really enjoyed my Cucumber, Apple & Mint as it is utterly refreshing to the palate. 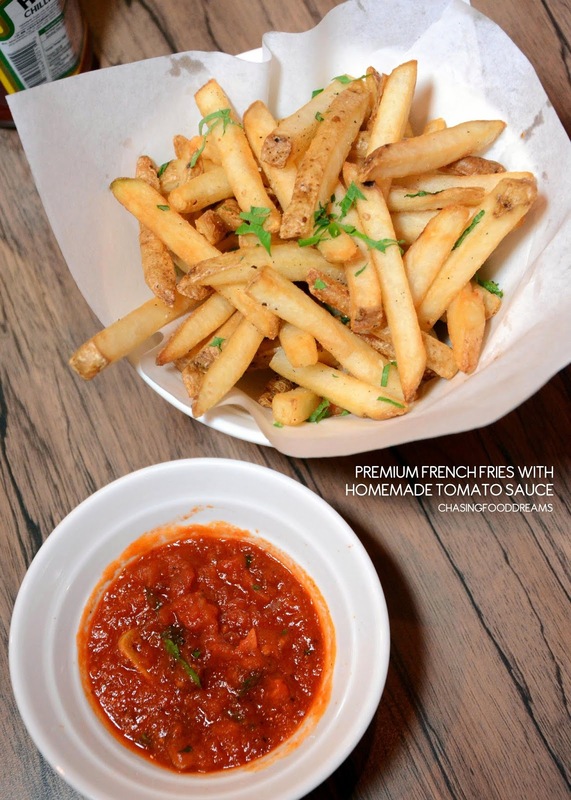 While waiting for our mains to arrive, we snacked on French Fries (RM6.80) served with housemade tomato sauce. I love it when restaurants use fresh potatoes over those pre-frozen kind for their fries. The skin is even left on for added flavour. It goes to show how passionate the owner is to go all out even just for side dishes. There is even an added bonus of a housemade tomato sauce to go with the fries. 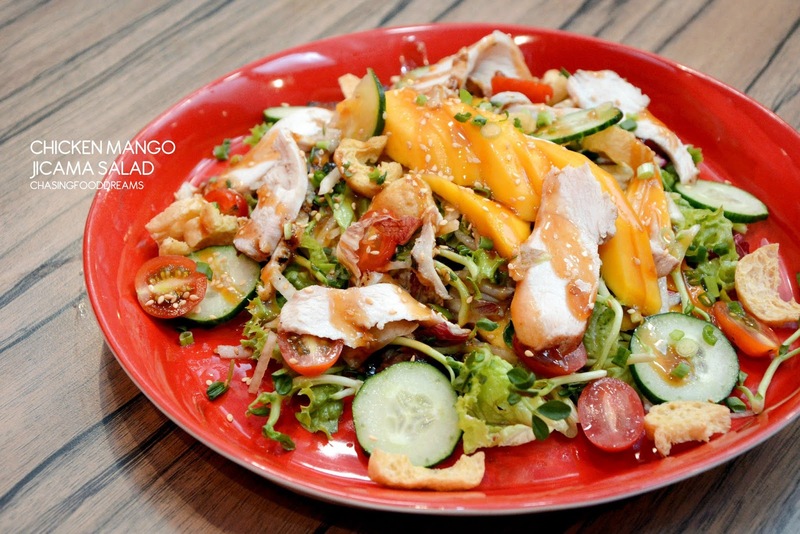 Mango, Chicken & Jicama Salad (RM9.80 Small RM14.80 Regular) is absolutely delicious! Even though I am not a fan of salads, I would gladly enjoy this happily. The salad has such vibrant flavours from its sweet ripe mangoes, grilled chicken, crunchy jicama batons, mixed greens with pea shoots, crispy tofu pok, cucumber, cherry tomatoes, aromatic sesame seeds and a sweet and tangy hoi sin sauce. The medley of flavours and textures is a pleasure to be devoured. Highly recommended, even for non-salad lovers! 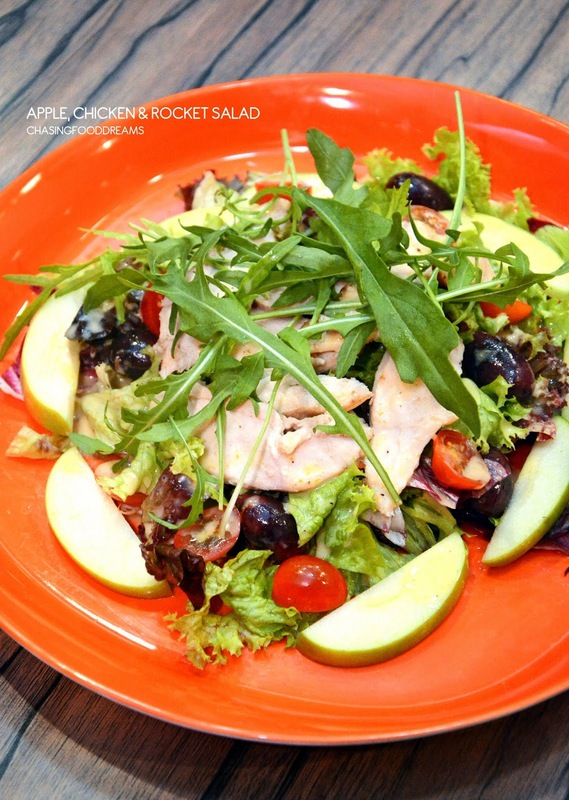 We also savored another salad of Apple, Chicken and Rocket Salad (RM7.80 Small RM13.80 Regular). I must commend Chili ESPRESSO for serving up healthy and delish salads. This one had crunchy apples with grilled chicken, rocket leaves, mixed greens, Kalamata olives, walnuts and a citrus dressing. The zesty zing in the salad made it easy to enjoy and it guilt-free too! It comes in two sizes so one can enjoy this as a side or as a full meal. Chili ESPRESSO has a nice decent list of pastas as well and we had one of their signatures of Double Cooked Duck Linguine (RM18.80). 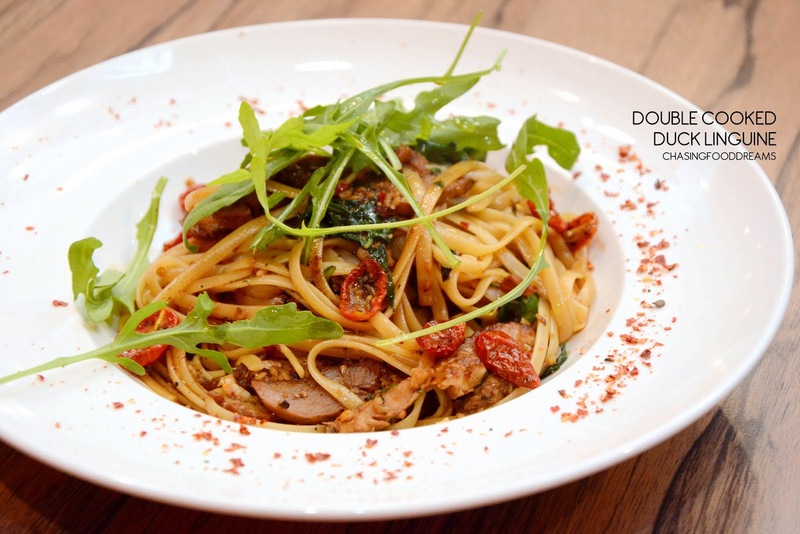 The duck is slow cooked with spices till tender before its sautéed with the pasta with oven dried cherry tomatoes in a lightly spicy sauce. I can taste the lovely garlicky notes as well as the hit of chilies. The intense tangy dried tomatoes added more oomph in flavours. The duck is on a salty note and gave the pasta a lovely moreish bite. One taste of Herbal Nasi Cina Kampong (Ulam Rice) (RM16.80) and I am literally raving over it that evening. 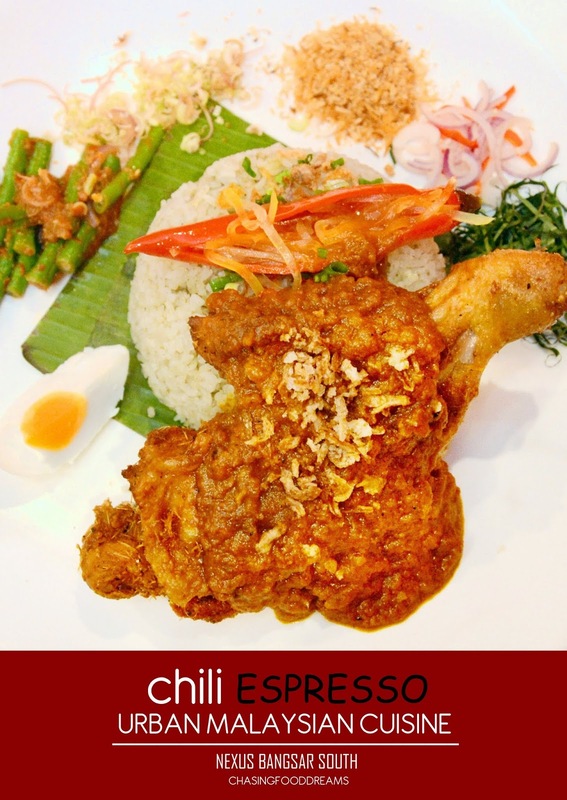 Chili ESPRESSO does a mean rendition of Ulam Rice and together with the tangy tomato rempah sauce drenched over fried kunyit chicken, the combo is a platter of sumptuous flavours and textures. The rice is fluffy and creamy. When mixed with the finely shredded shallots, red chilies, bunga kantan, kaffir lime leaves, fragrant toasted coconut and fried shallot, it is bursting with a rainbow of flavours and aroma. I also enjoyed the authentic stuffed red chili with pickled green papaya as it gave the dish a punchy tangy kick. 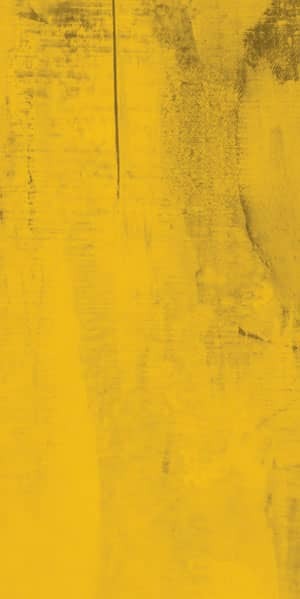 The turmeric marinated fried chicken is superb and is nicely perked up with a creamy tangy and lightly spicy nutty sauce. Another dish highly recommended in my books! 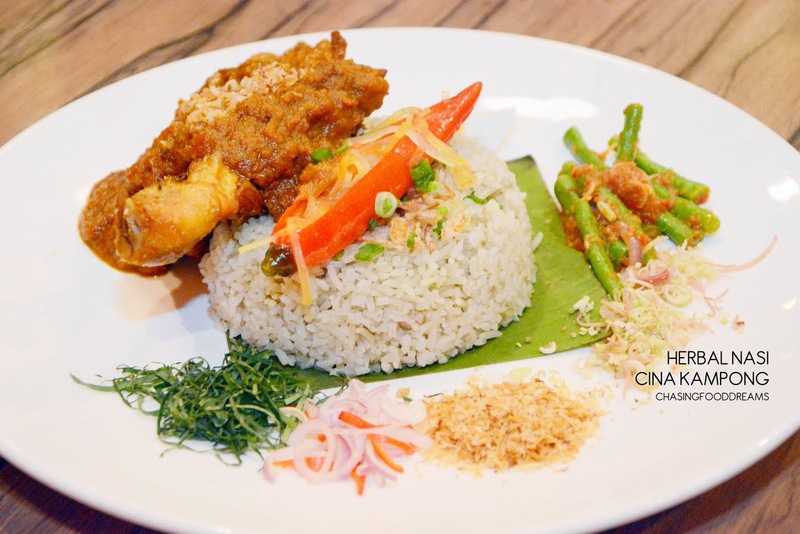 One can even have the Ulam rice with an option of Ikan Tenggiri with Tamarind Kaffir Lime Leave Sauce if chicken is not to your liking. 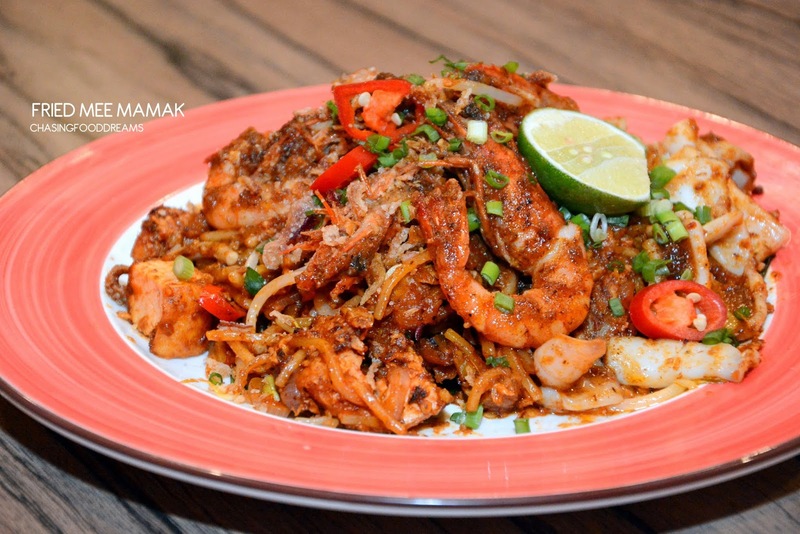 Penang Fried Mee Mamak (RM15.80) is also another signature of Chili ESPRESSO. Since I am from Penang, I can personally say that this one really tasted pretty authentic in flavours. It had a good wok of breathe and the savory sweet taste of the sauce really reminded me of the mee mamak that I had grown up with. This one was more lavish as it had lots of seafood of prawns and squid added together with cucur and boiled potatoes. A good sprinkling of peanuts and a squeeze of lime are the perfect sidekicks to the dish. 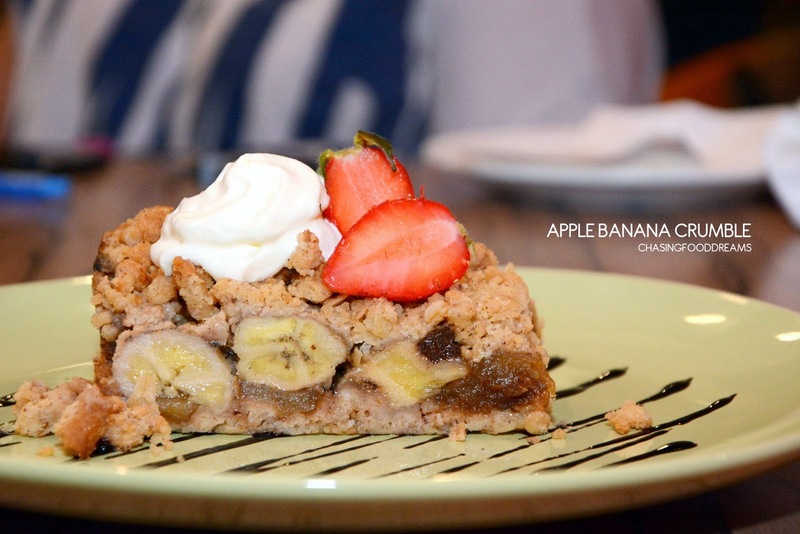 We finished the evening with house made Apple Banana Crumble (RM9.80). It may be a simple dessert and I would never thought to pair apple with banana but the dessert is decently satisfying with a toasty cinnamon note. I had Café Latte (RM7.80) to round up the meal. I like the latte here as it is sufficiently good in coffee notes. I was pretty much charmed by the dishes in Chili ESPRESSO. Lots of hits without any miss in this meal. The food here tastes humble and comforting. Plus points go to the effort for making everything from from scratch and prices are affordable and value for money. There are lots of other dishes that I would love to come back for such as Nasi Lemak, Thai Green Curry, Percik Ayam Siam, Char-grilled Portugese Piri Piri Chicken, Homemade Chicken Pie, Thai Basil Chicken & Pineapple Pizza and more.